The starting point for this very nice trek/climb is the mountain village Ranu Pani. A major city from where one may travel is Malang. 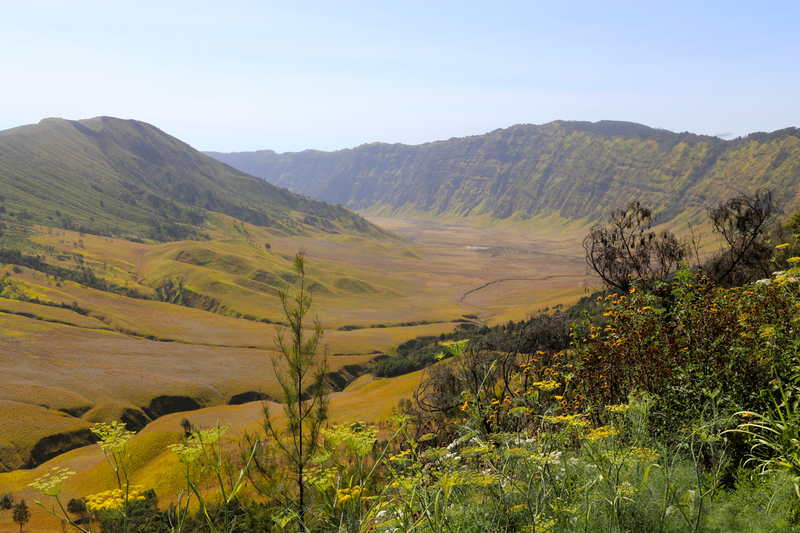 The drive from Malang to Ranu Pani takes about 2 hours. 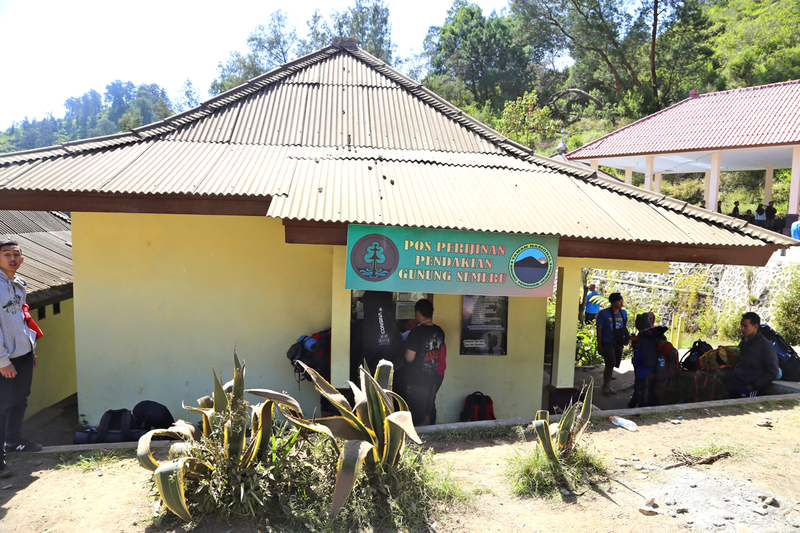 One first drives from Malang to Tumpang, in Tumpang one may quick and easily obtain the required medical certificate. 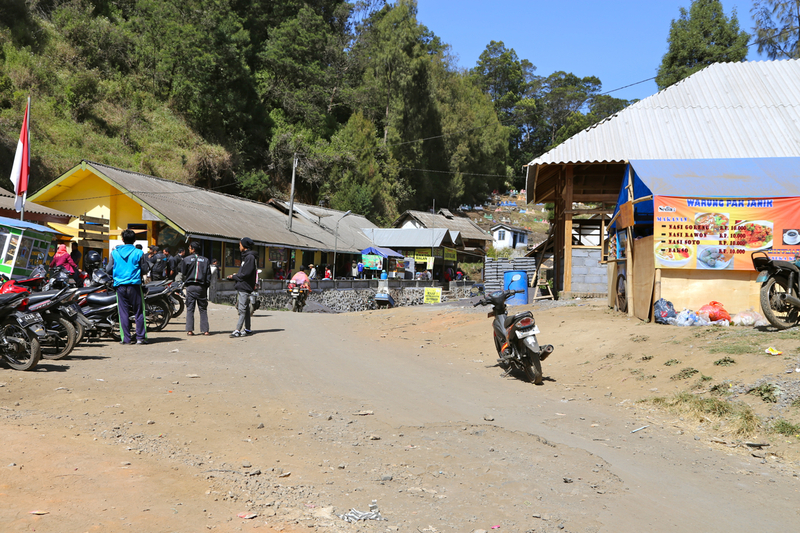 There is a good local supply of transportation services between Tumpang and Ranu Pani as well. (Share space in a jeep etc.) Contrary to what is often said, the road from Tumpang to Ranu Pani is actually for the most part quite good. The road is also quite scenic, running partly on top of a very narrow ridge as high as 2400 meter. 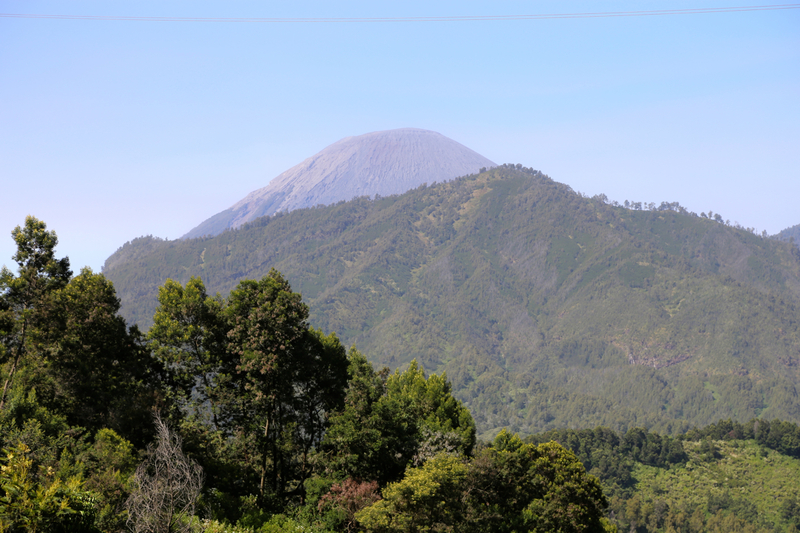 Gunung Semeru is visible from the road, nice to see the mountain before actually walking. It can certainly be driven by normal cars as long as one pays attention to a few, short sections having some road damage. The park office and trailhead is located at the very far end of the village, beyond the last parking area. This location is S08.01414, E112.94549, elevation about 2130 meter. There is a certain amount of red tape, however, this is normally not a big problem. A medical statement that declares reasonable health is perhaps the most unusual requirement. Most people arrange that in the nearby town of Tumpang. There is a doctor there that obviously specializes in providing just this information. This is quick and inexpensive. Next, you fill in a form that asks various questions about your trip. All this is presented at the window on the left hand side of the road at location S08.01414, E112.94549. In 2015, I paid 207.500 (IDR) for a permit. You do receive a copy, when you return you should report back and they will record that you are exiting the park. Continue along the road from the park office, it curves right, then descends into a small valley with farms. Follow the road along the left side of the field, you will see a portal up ahead, turn right (going through this portal). The path now runs straight ahead, but you should take the left fork that goes uphill, this is quite shortly after the portal. Just after the top of this first uphill, there is a signed fork. The smaller trail going right, is a short-cut, but you do have to climb over a small hill. The bigger trail is left, it runs around this ridge and meets the smaller trail on the far side. Either choice is fine, I did both trails (going and coming). The trail now runs along the general hillside, curving in and out of several smaller side-valleys. 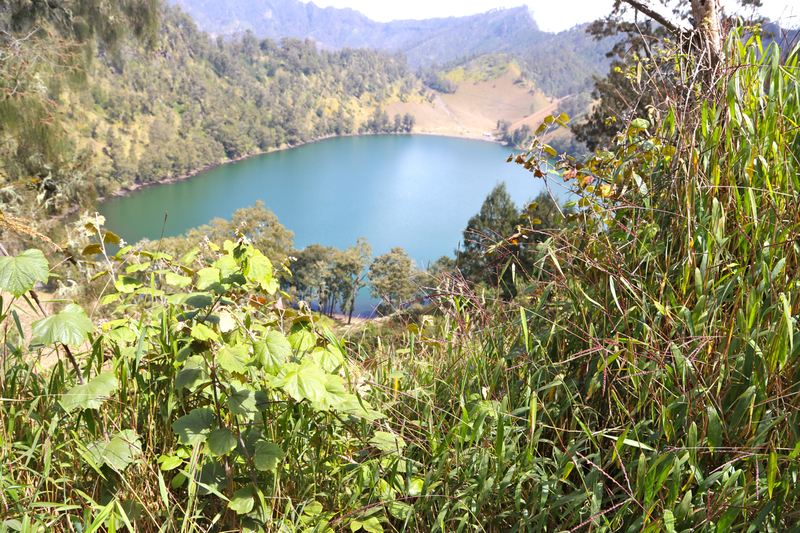 Finally, it climbs a bit more steeply (right), then crosses more inland and soon overlooks lake Ranu Kumbolo. Descending to the lake, then crossing from the first (minor) to the second (more major) camp site. The route now ascends from the lake to a small local col, then descends to a flat, open area with grass. 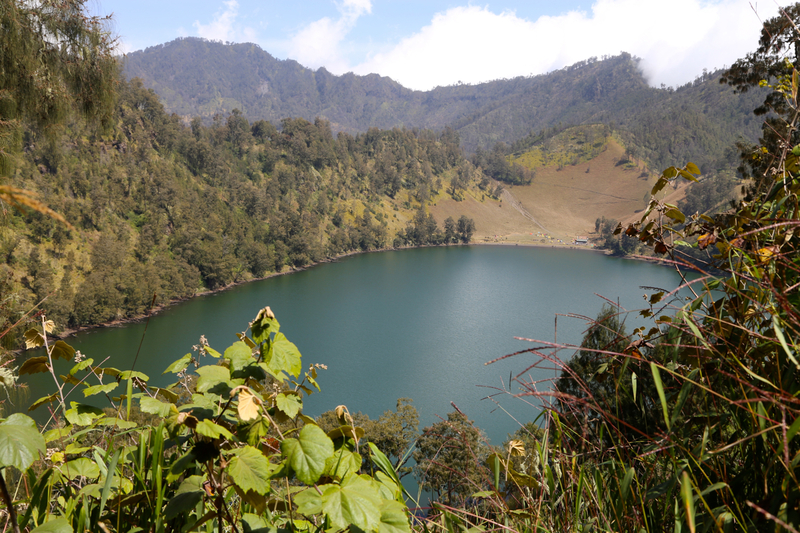 From here, a gentle ascent through fairly open forest to a new, higher col. From this col, called Jambangan, you will see Semeru, a lot closer. 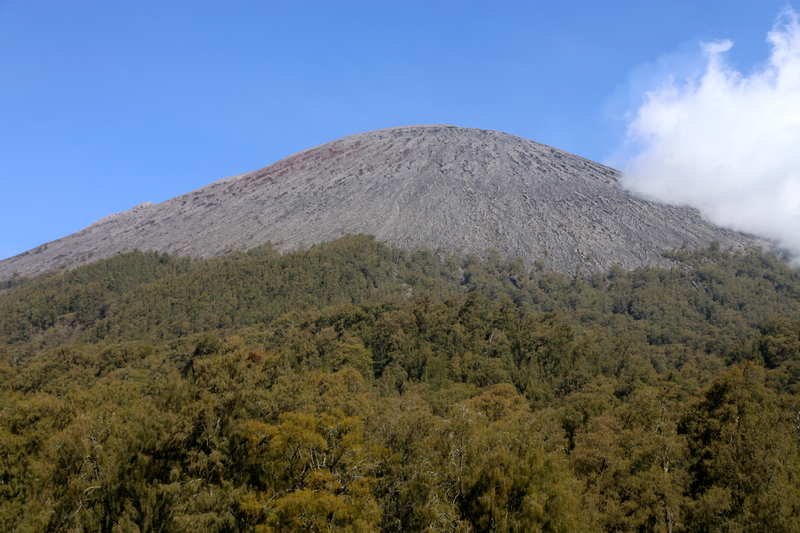 In fact, you realize that Kalimati must be pretty close, located in the saddle between this col and Semeru itself. 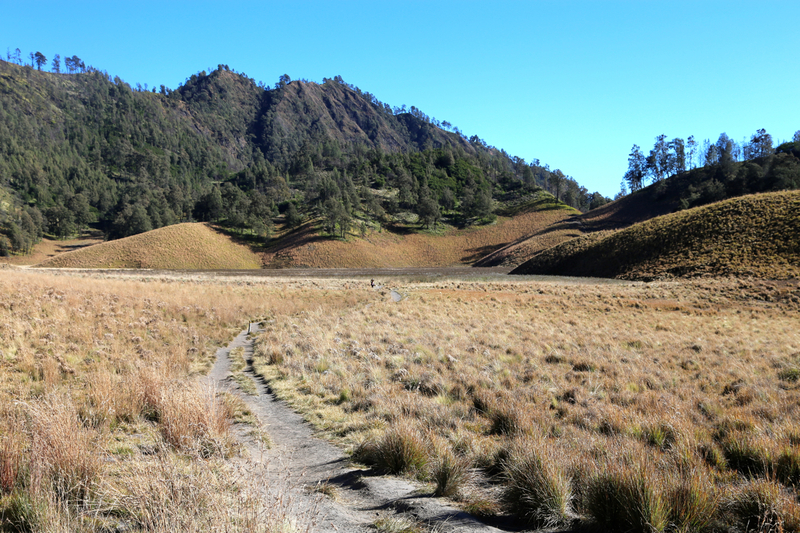 Thus, the trail now heads directly towards Semeru, gently downhill to the Kalimati camp site. Cross the saddle and head towards the small building. The route runs into the forest just behind this building. The trail will soon ascend steeply among the trees, this is the first time that one may say the route is (YDS) class 2, until here it has been a class 1 trail. Near the top of this small ridge, shortly before the trees end and only the final ascent remains, there are a few flat spots that may be used as a high camp. The route now connects nicely with a final, sandy path that extends directly up the slope. This section is non-trivial since the scree and sand tends to move downhill whenever you try to go uphill. 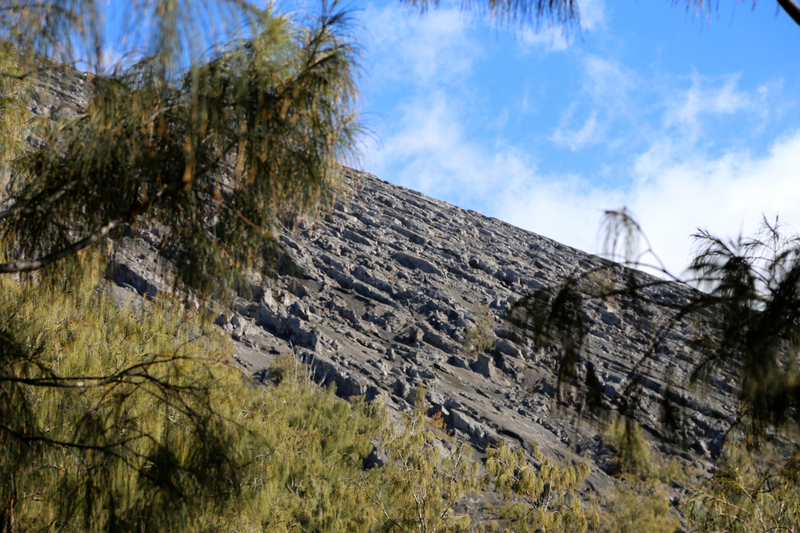 Finally, near the top, you enter a short stretch of lava with small, passages that lead uphill to the summit plateau. The summit area is pretty large and almost flat. Before arriving in Malang, I had several exchanges of email with my hotel concerning this trip. They were very friendly, but kept proposing a trip that would be to long (in duration) as well as too complex (in terms of people and scheduling). I finally decided that the best way to do this climb would be to only reserve transportation, then climb solo without guides/porters. I generally feel fine about buying some local services in countries like Indonesia, but this time it just seemed to carry with it too many complications. Transportation to Ranu Pani, is another issue. Many will claim that you need an expensive Jeep (4WD) vehicle because of a poor road. This is, however, not true, a normal car can easily make it there. The road is paved all the way, the only trouble being some short sections with pot-holes and damage to the road surface. These sections can be driven as long as some appropriate care is exercised. My hotel understood what I wanted and provided a car with driver that would drive me from my hotel in Malang on Friday, then come back up to Ranu Pani and drive me back to Malang on the next day. A price of 1.700.000 was agreed, transportation can clearly be organized for less, but this was "door to door" at my convenience and as such quite acceptable. I started hiking at 1005, the weather and temperature were both perfect and the trail indeed very nice and enjoyable. Perhaps a bit crowded, many locals were walking the same trail in both directions. 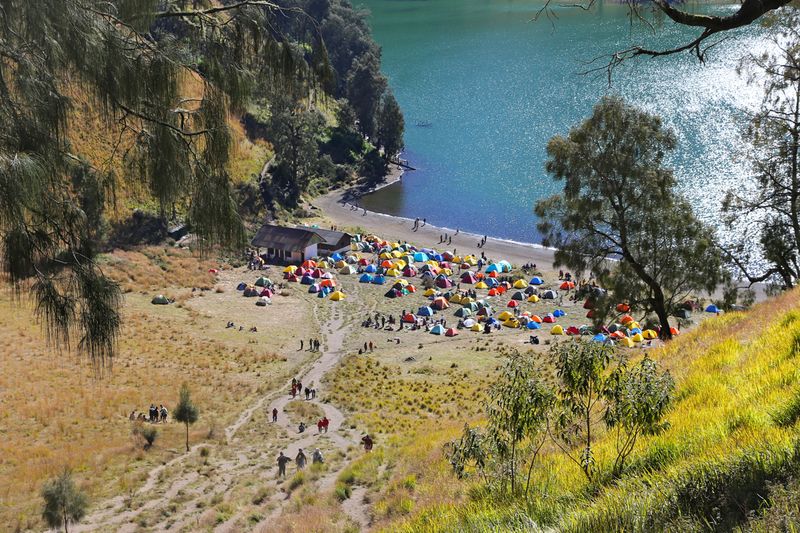 I arrived at lake Ranu Kumbolo at 1205, this was a bit quicker than anticipated. Many tents and hectic activity. One group of people carried out some religious prayers, other groups were busy with many different tasks. People would approch me all the time and ask if they could get a picture with me. I generally said yes, this was always appreciated. People were smiling, but if a group of 6 shall each have a picture, this involves 6 differnt pictures, all being arranged etc. I took a 30 minute break by the lake, mainly just to observe the local activity. 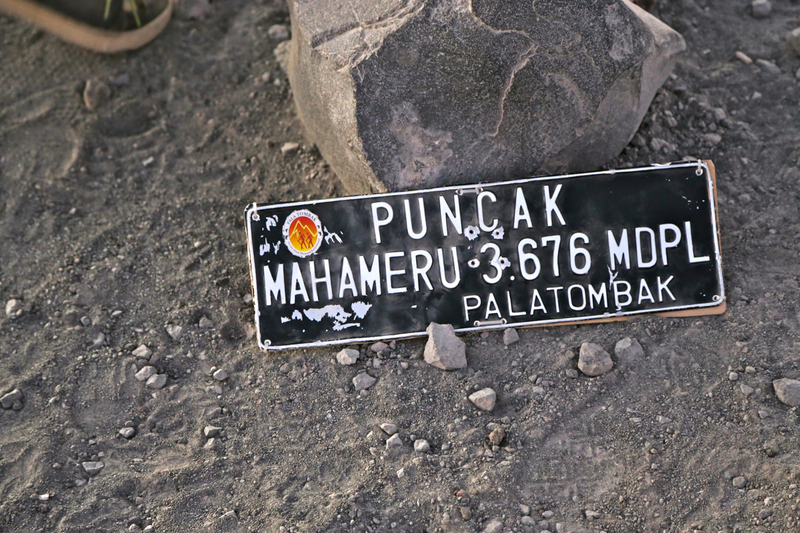 I knew that I should only walk to the base of Semeru today, then sleep overnight. There were no reasons to arrive at my camp too early in the day. Thus, I continued my walk around 1230. 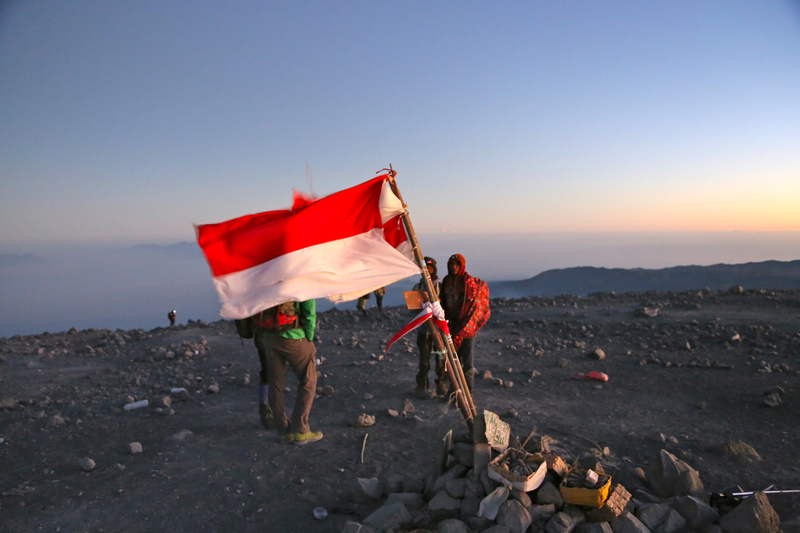 Before long, I reached a distinctive saddle and Semeru came back into view, much closer than before. 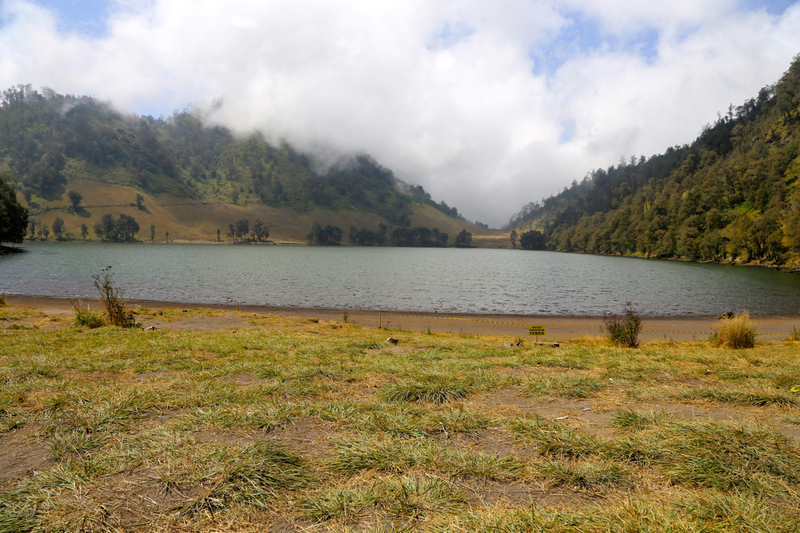 It had only taken me one hour to get here and I realized that Kalimati could not be very far away, necessarily before Semeru itself. 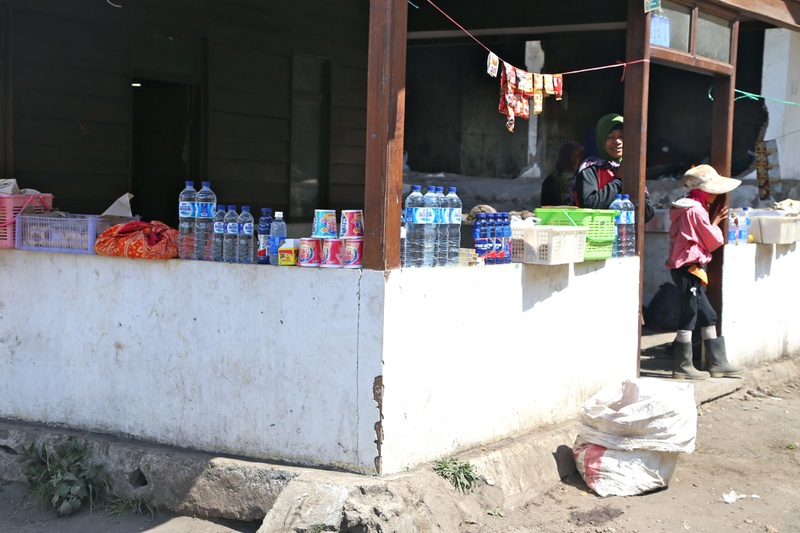 A local entrepreneur had set up business at this saddle, big slices of water melon for sale. The temptation was irresistible, I bough 4 slices and decided that another good break was called for. 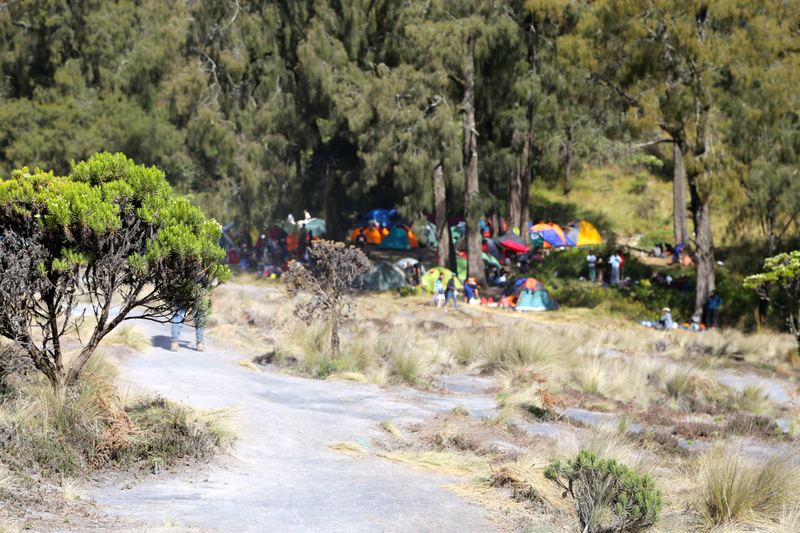 It was still early in the day when I walked across the Kalimati camp with more than 100 tents, then proceeded up the trail that leads to the summit. My plan was to camp as high as possible, then climb to the summit the next morning. 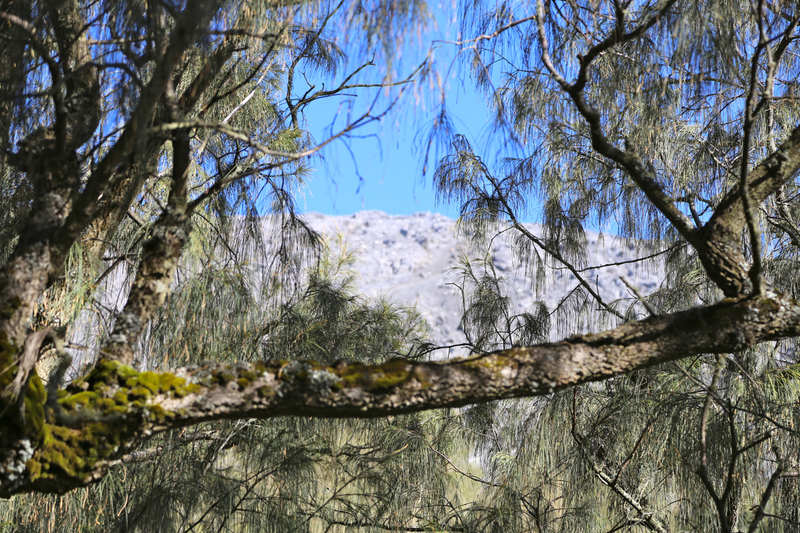 The weather was fine and I realized that there would be time to climb the mountain today, but then too late to return to Ranu Pani in daylight. 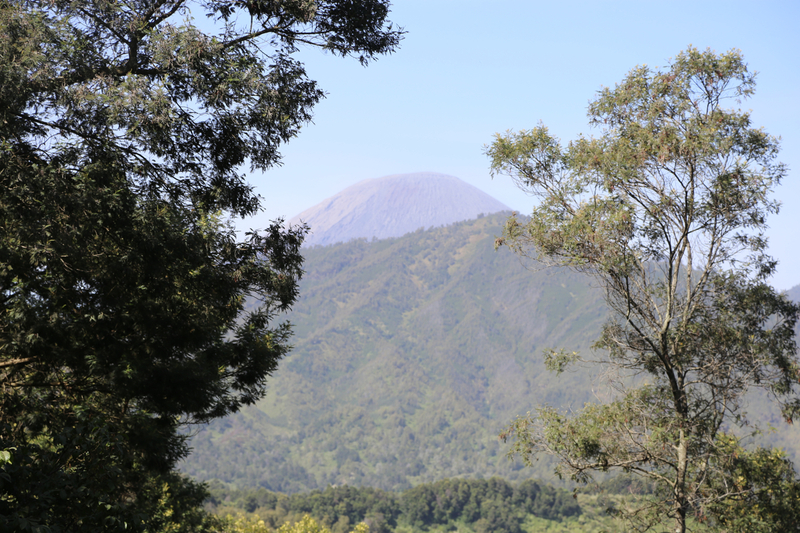 However, it is clear that if you start from Ranu Pani in the early morning, then one can make this climb as a day hike, returning before dark to Ranu Pani. I found a perfect spot to camp, almost at the top of this area with trees, flat and out of the main trail going uphill to the summit. I knew that many climbers would start early and I did not want them to disturb me more than necessary. This spot was at S08.09693, E112.91968, elevation 3050 meter. 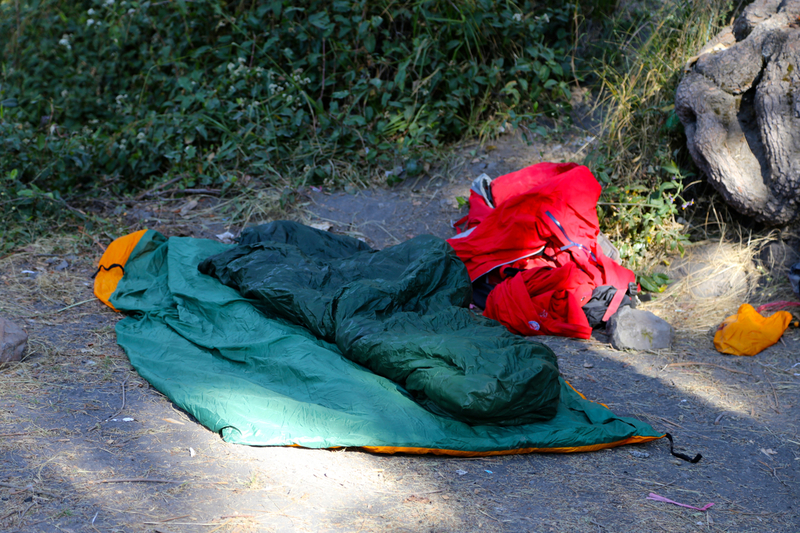 I quickly got organized and crawled into my sleeping bag before 1600. With about 600 more meter to gain, it seemed reasonable to start hiking at 0345 the next morning. This should put me on the summit just before sunrise. The sun set and I had a good time watching stars before falling asleep. The first team coming up from Kalimati passed me (too close!) already at 2330. Fortunately, they were a bit lost, all the teams that followed picked the proper trail and did not disturb me. I woke up as planned around 0330 and started uphill at 0345. A long string of lights stretching up the slope above me. It looked like everybody was descending! I soon discovered what caused this. At any given time, about 90 percent of all teams were resting, more or less collapsed on the ground, facing out. People had incredible trouble with the loose scree and sand. Many seemed to slip more backwards than their move uphill. Some were trying to drag the person behind uphill, some were already crawling with arms and legs in the sand. It had not rained for more than a week and the slope was indeed very loose. Using my boots to kick as if in snow, taking slow, but fairly long strides got me uphill at a very reasonable speed. I passed more than 100 climbers, many of whom would obviously never make it anywhere near the top. I arrived on top at 0515, so precisely 1.5 hours. 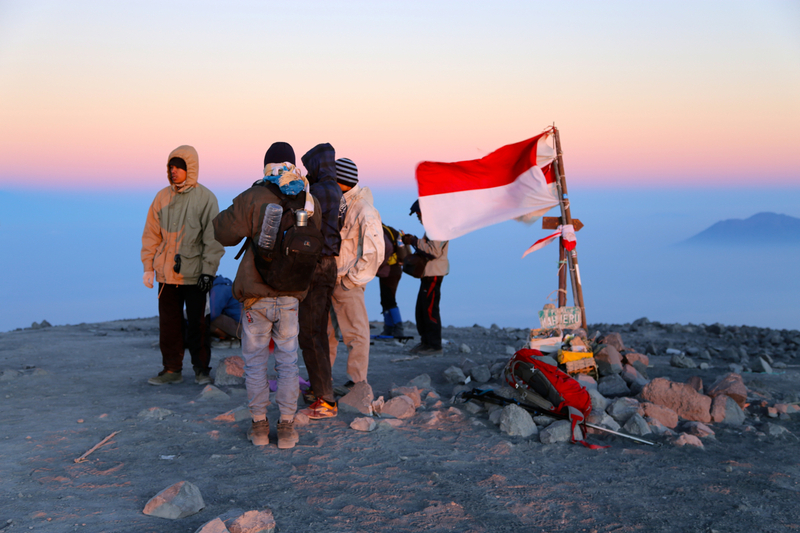 The very summit is called Puncak Mahameru. The horizon was red, but the sun still below it. What immediately caught my attention was the volcano Ruang further east. What a nice eruption with the rising sun. Thick smoke going straight up, then bending 90 degrees and stretching south as far as I could see. 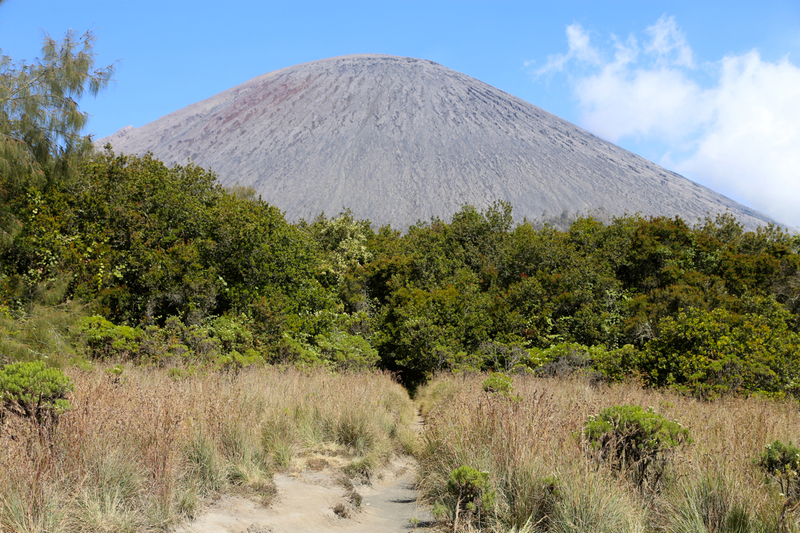 This volcano had just a week ago shut down the Denpasar airport in Bali, our very next destination. The sun came at 0530 and to make things even better, Semeru itself decided to say good morning! 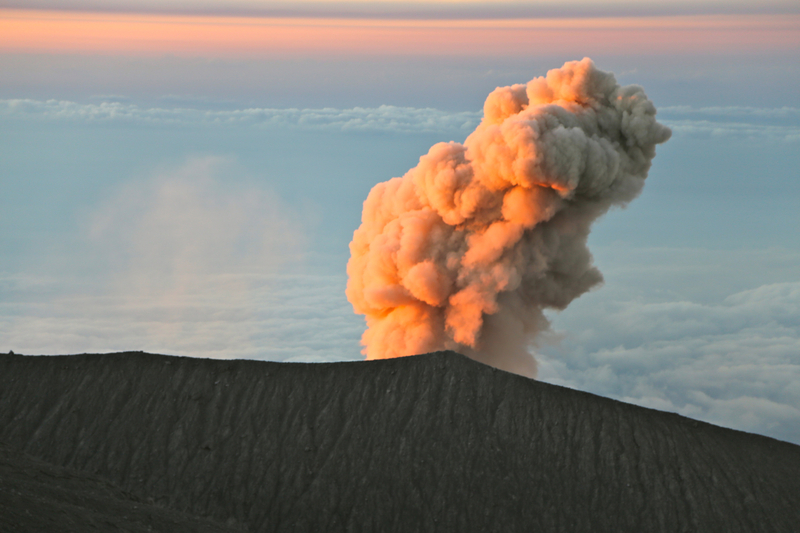 A loud bang followed by a cloud of smoke, nicely illuminated by the rising sun. I bumped into Florian, a young German man that also had climbed solo. We descended together at 0545. It took me 30 minutes to reach my campsite. Leaving there around 0645, I walked back to lake Ranu Kumbolo in about one hour from Kalimati. After a long break there to eat some (limited) breakfast, Florian and I hiked together back to Ranu Pani, arriving there at 1100. I had booked my return transport for a 1400-1500 departure, so lunch and a few hours to look at the general life in the village. Florian was happy to get a ride with me back to Malang. Thanks for good company! The evening at hotel Tugu was nice, Heidi and I had lobster for dinner and a good German riesling wine, a perfect way to celebrate that my climbs in Java now had come to an end. Two days later we travelled onwards to Bali. 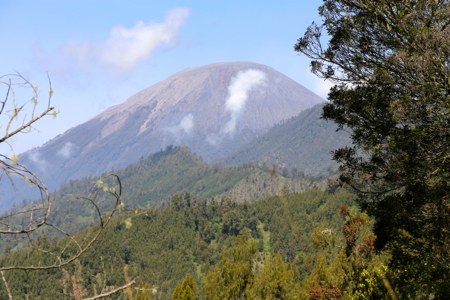 Semeru, as seen from the trail. 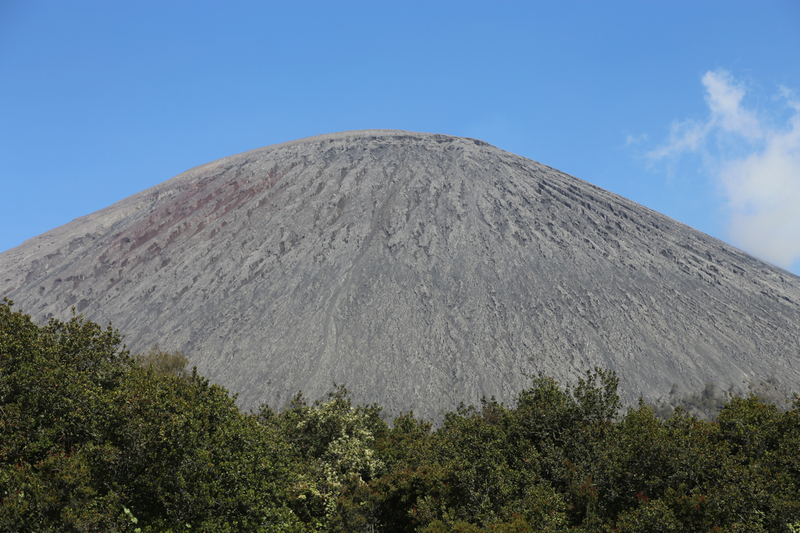 Semeru, as seen from Jambangan. Semeru, as seen from my camp site. 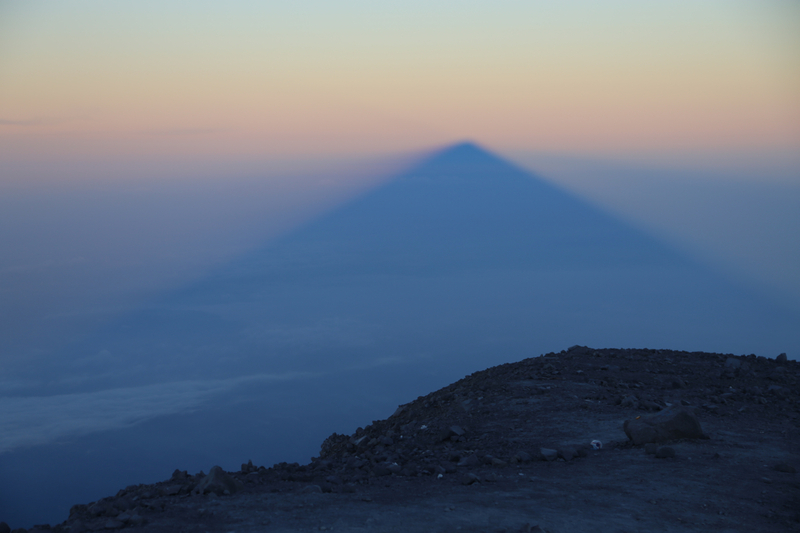 The shadow from Semeru, at dawn. 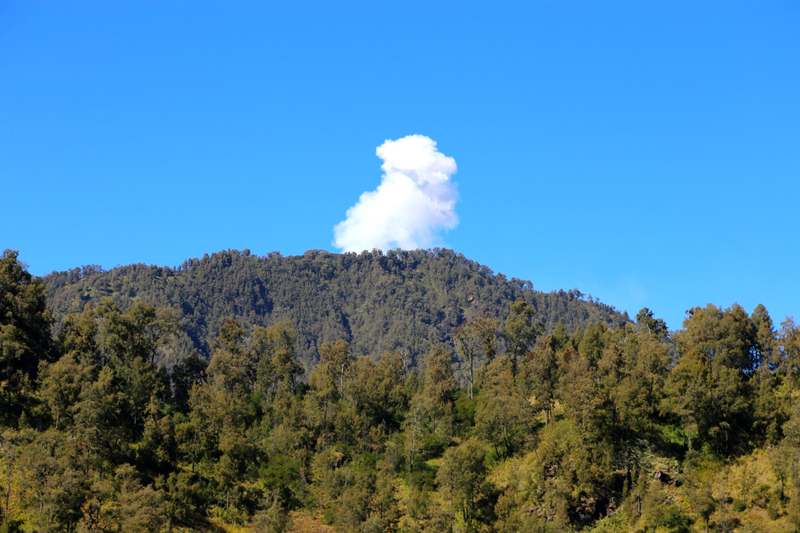 Semeru says goodbye, as seen from Kumbolo lake.